Bini is a five-year-old Holland Lop rabbit from California, US, and he is far from being an average pet. 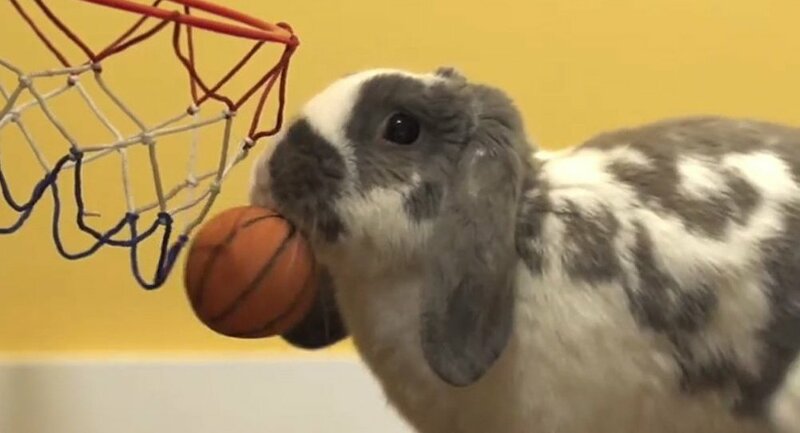 The bunny recently bounced his way to worldwide fame for his outstanding skills in basketball: Bini holds the Guinness 2018 Amazing Animals record for the "Most basketball slam dunks in one minute by a rabbit." The fluffy athlete can strike seven balls into a miniature basketball hoop within a minute — impressive, isn't it? According to Shai Asor, the owner of the rabbit, Bini developed his passion for ball games a long time ago, and since Shai noticed that, he began to train his bunny. Now basketball is Bini's favorite activity: he practices his dunks every night before going to bed. "Having Bini become part of the Guinness World Records family is an incredible feeling, especially since I used to read the annual books when I was a kid," Shai said. The proud owner of the pocket-size basketball player also noted that Bini enjoys the arts as much as sports. The talented rabbit is capable of styling hair and painting, by holding a paint brush in his mouth.